Restored Health's Nerve and Wound Balm may be excellent for any issues with nerves (like neuropathy, fibromyalgia, nerve pain, etc) and wounds. 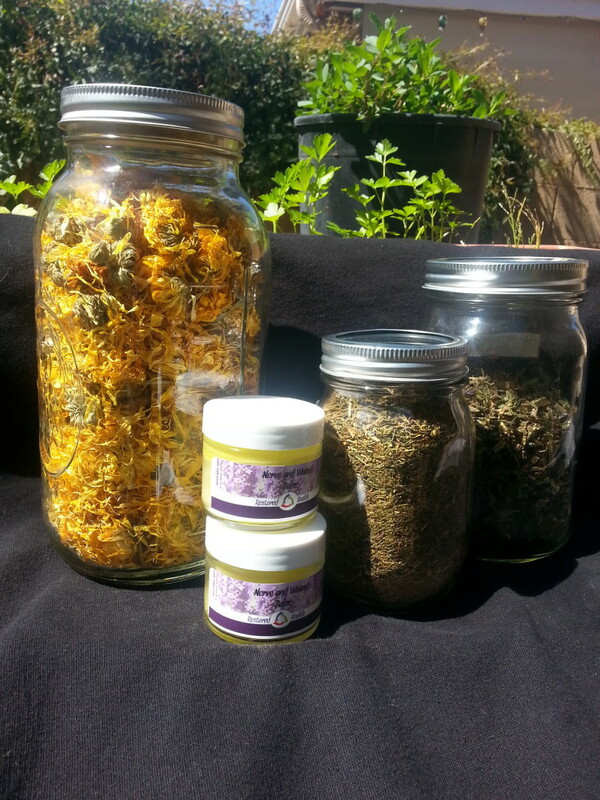 This balm is made from herbs comfrey, St. John's Wort, calendula, extra virgin olive oil and helichrysum essential oil. This balm can also help with inflammation. Rub right on your nerve pain, inflammation, around an open wound or on top of a wound that has scabbed over. It may relieve pain and heal much quicker. You can also rub it right on a bruise. I have had several people tell me their bruises have either faded quickly or completely disappeared after less than 24 hours. We have asked people to apply every two hours until they are satisfied with the results. Of course we are only satisfied when the issue is gone!! Please store in a cool, dark place away from children. 100% pure, organic or wildcrafted essential oils and herbs. "During your class today I put some of the wound balm on an, as yet, unhealed injury from playing with my friend's puppy and began to see it lighten in color. Upon leaving I put more on and saw it lighten more and the puffiness diminish. This stuff is awesome!!" The following morning Georgia emailed me again and told me "by the way, with another application this morning it's barely visible!!! Yay!!" Georgia K.
I put the Nerve and Wound Balm on bruises I had. There was a large bruise and three smaller bruises very close to the larger one. After about five minutes the three smaller bruises disappeared! The larger bruise got much lighter, changing color within a few hours to the yellowish green as it faded several days later. Tony S.
Last night I used your Nerve and Wound Balm on my restless legs. I rubbed it right on my hips and upper legs. I slept wonderfully! Jean P.
My mom fell directly on her face recently. Once she could actually touch her bruised face she applied the Nerve and Wound Balm. It only took a few days for the bruises to all go away! LaNae F.